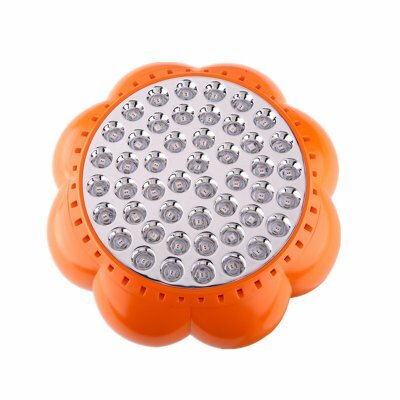 Successfully Added LED Grow Light – Pumpkin Design, 5:1 Red/Blue LED Ratio, 100-Degree Light Angle, 48 LED Lights, Increase Growth and Yield to your Shopping Cart. Grow bigger and stronger plants with this uniquely shaped LED grow light. Thanks to its fitting pumpkin design, this LED grow light will be a great asset to your green house. Use it to grow fruits, vegetables, or regular plants and flowers – nothing is too much for this LED grow light. Thanks to its 5:1 ratio of red/blue LED lights, this grow light treats your plants to the most efficient light spectrum to grow thick and strong. Not only will your plants grow healthier, their colors also become brighter and yield increase significantly. Within a couple of days, you are guaranteed to see the results. The LED grow light comes with a built-in fan for efficient heat dissipation. Your 48W grow light comes with a total of 48 built-in LED lights. With a 100-degree beam angle, this gadget is able to reach an abundance of plants and flowers. Thanks to this, you can use it for multiple plants at once. The LED light itself features a life of up to 50,000 hours. Therefore, you won’t have to worry about replacing your grow light any time soon. If you’re looking for a cheap, efficient, and environmentally friendly way to increase your yield – this LED grow light is the perfect gizmo for you! This LED grow light comes with a 12 months warranty, brought to you by the leader in electronic devices as well as wholesale gadgets..